For casual gamers who do not need the most powerful gaming laptop that is available on the market, it is sometimes difficult to decide whether to pick a computer that is more gaming-oriented or one that is better for productivity. 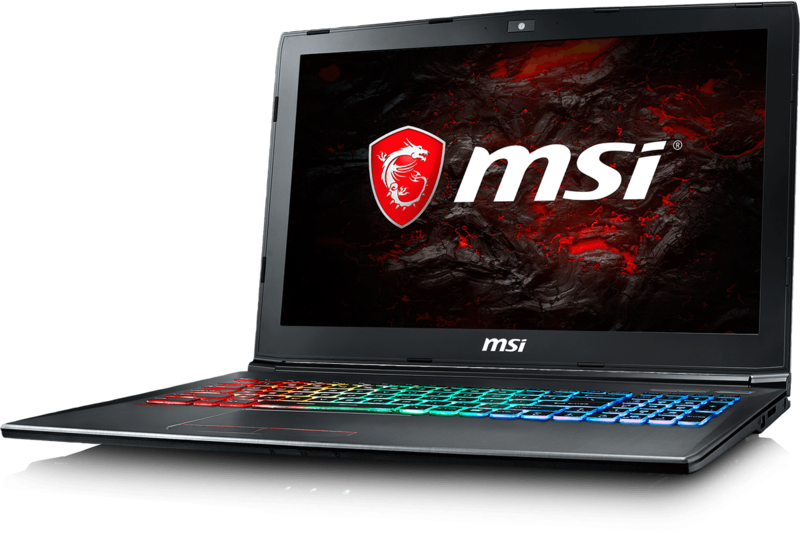 To answer this problem, MSI has launched another affordable mid-range gaming laptop, the MSI GF62 7RE-1808XES, that seems to be able to satisfy the needs of a casual gamer. This gorgeous and sleek laptop is built with a cool metallic grey design with an elegant brushed finish; a design that seems to be consistent across MSI's line of gaming laptops. Its size is also very consistent with typical gaming laptops: 15.6" display, 29 mm in height and about 2.2 kg in weight - nothing particularly unusual here. One exciting element of this laptop has to be its modern and ergonomic SteelSeries keyboard with RGB backlighting. The monitor also has a 94% NTSC wide-viewing panel that allows a clear view from both the left and right angle. The new MSI GF62 7RE-1808XES comes with an Intel Core i7-7700HQ processor, which has an integrated 6MB SmartCache memory and 4 cores which, thanks to the amazing Intel Turbo-Boost technology, will reach a frequency of up to 3.80 GHz. The notebook is also equipped with a dedicated NVIDIA GeForce GTX 1050 Ti graphics card with 4 GB of DDR5 RAM, and a very generous helping of 16 GB of RAM. Another strength of this laptop is the hybrid 1 TB of HDD and 256 GB of SSD storage capacity. Gamers should be able to run modern AAA games at max settings and still get a steady 60 FPS. Now, let's talk ports! The MSI GF62 7RE-1808XES has a generous lineup of USB connectivity with one USB-3.1 Type-C ports, two USB-3.0 Type-A ports and one USB-2.0 port. It also has a dual-band WiFi and Bluetooth 4.1 combo adapter, an Ethernet-LAN port and an SD-card reader. For the display, the laptop comes with one HDMI and a mini DisplayPort output respectively, and this combination will allow the user to connect up to two external monitors at the same time thanks to MSI's very own innovative Matrix Display support. Matrix Display supports 4K output with a resolution of up to 3840 x 2160. To help gamers get more out of their gaming experience, MSI also included the highly acclaimed immersive 3D sound solution, Nahimic 2+, in their Audio Boost. And for those who enjoy competitive gaming or online multiplayer games, the upgraded Killer Ethernet E2400 chipset and its easy-to-use Killer Networking Manager will help bring a more positive online gaming experience with consistent ping. With all these impressive features and hardware specifications, the reasonably priced MSI GF62 7RE-1808XES proves that you do not need to spend a fortune to own a reliable gaming laptop. Positive: Large screen; excellent display; good price; decent hardware. NVIDIA GeForce GTX 1060 (Laptop): The mobile GTX 1060 is based on the GP106 chip and offer 1280 shaders. Compared to the identically named desktop version it features a slightly lower clock rate. Games in Full HD and maximum details should run fluently on the card.With these GPUs you are able to play modern and demanding games fluently at medium detail settings and HD resolution.